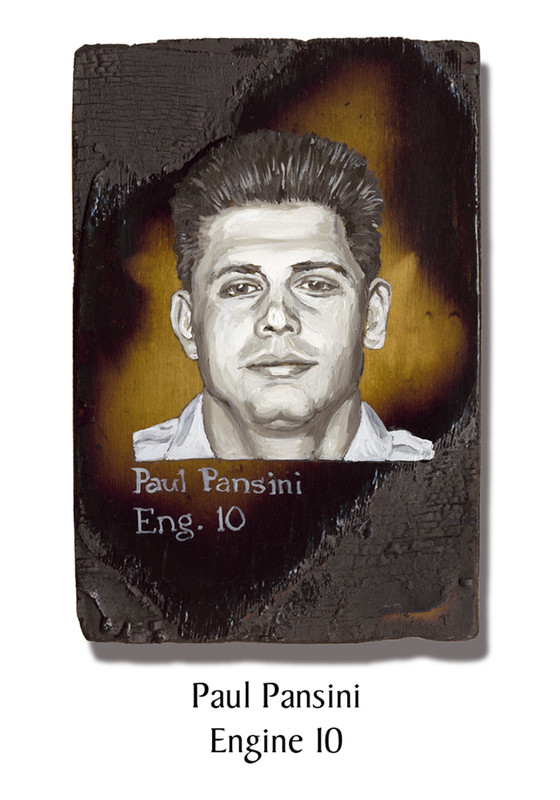 Paul Pansini had spent his entire 11-year FDNY career at Engine Co. 10. Although only 34, this longevity made him one of the senior men at the house. That morning he had volunteered to fill in with Engine Co 26 in Midtown and he responded to the WTC with them. Pansini came to the FDNY after a few years with the NYPD. His younger brother was following the same path and they had both looked forward to working together as firefighters. A huge Springsteen fan, Pansini was also a black belt in judo who won medals at the World Firefighter Games more than once. Posthumously promoted to Lieutenant after 9/11, Pansini left behind a young son and even younger twin daughters. This entry was posted in Better Angels Stories and tagged 343, 9/11, better angels, Dawn Siebel, FDNY, firefighter, firefighters, firefighters of 9/11, LODD, memorial, NFFF, paintings, Paul Pansini, World Trade Center, WTC. Bookmark the permalink.